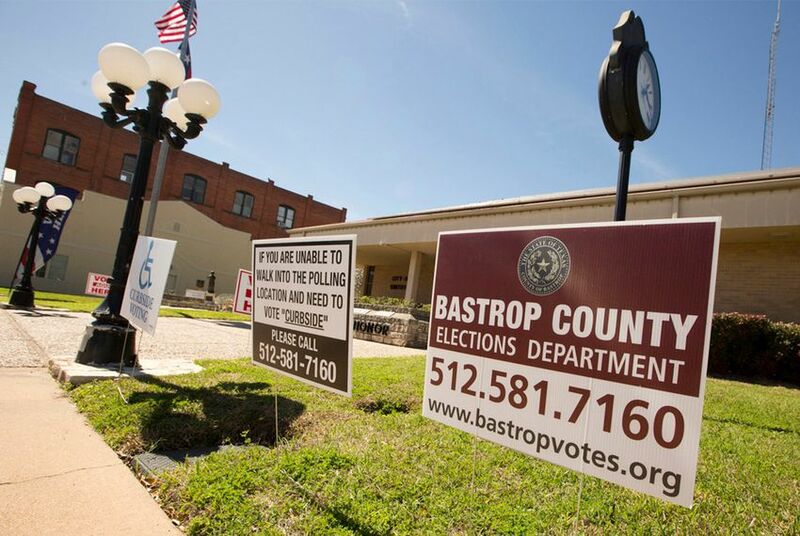 From the primary for Bastrop County Republican Party chair to the Republican primary for Montgomery County judge, some incumbents fell to their challengers after a difficult campaign season. In Dallas, a Democratic Party chairwoman fought to hold on to her seat after the county GOP filed a lawsuit to remove 127 Democratic candidates from the general election ballot. In San Antonio, a district attorney and his ex-friend, who challenged him in the Democratic primary, attacked each others' characters. And outside Houston, a Republican county judge hoped to win again despite facing criminal indictment. Texas on Tuesday held the country's first statewide primary since President Donald Trump was elected. Here's how six of the most interesting local races turned out. Incumbent Carol Donovan held onto her title despite concerns about her leadership after the county GOP filed a lawsuit seeking to remove 127 Democratic candidates from the general election ballot. She beat lawyer Chris Hamilton by almost 13 percentage points. Hamilton, who agreed the Republicans filed a "frivolous suit," said Donovan's lackadaisical approach to certifying the candidate petitions in question was partly to blame, according to The Dallas Morning News. The race drew attention from high-profile Texas Democrats — such as U.S. Rep. Eddie Bernice Johnson, D-Dallas; U.S. Rep. Marc Veasey, D-Fort Worth; and former U.S. Trade Representative and former Dallas Mayor Ron Kirk — who all endorsed Hamilton. Still, the Morning News reported, Hamilton was criticized for being too closely tied to his major donor, Dallas lawyer and Democratic Party benefactor Lisa Blue Baron. And, the Morning News reported, while Hamilton promised to heal the divide within the Democratic Party and raise more money, Donovan contends that the party is in great shape. Dwight Parscale — the father of entrepreneur Brad Parscale, whom Trump recently tapped as his 2020 campaign manager — lost his race to become the next GOP chairman of Bexar County, which includes San Antonio. Social conservative candidate Cynthia Brehm and former U.S. Alcohol, Tobacco and Firearms agent Jo Ann Ponce Gonzalez will be headed to a runoff. They each received about 45 percent and 23 percent of the votes respectively. Parscale received around 21 percent, followed by University of Texas at San Antonio graduate Andres Holliday at around 11 percent. Parscale was endorsed by outgoing chairman Robert Stovall, who in the fall of 2017 appointed him as vice chairman of the Bexar County GOP. Stovall in turn received Brad Parscale’s support in his primary bid — which is looking to be unsuccessful — for Republican U.S. Rep. Lamar Smith’s San Antonio seat. Also in Bexar County, District Attorney Nico LaHood conceded the race for his seat to former law partner and ex-friend Joe Gonzales. Gonzales led by roughly 20 percentage points. "Whomever the next DA is they will be starting off in a better position than I started off in," LaHood said at a Tuesday night watch party in San Antonio, according to a video posted on Twitter by a reporter for News 4 San Antonio. "In my opinion the voters were unfairly influenced by $1 million worth of lies," he added. "But we have a system, and the voters have spoken, and I respect their voice." The primary campaign proved vicious. The candidates criticized not only each others’ legal experience but also each others’ general human decency. The San Antonio Current reported that in their attacks, LaHood compared Gonzales to Harvey Weinstein and Gonzales compared LaHood to Donald Trump. Gonzales also accused LaHood of pretending to be a liberal — the incumbent once called himself a “conservative guy,” is openly intolerant of Islam and declared on talk radio that he does not support sanctuary cities, according to the Express-News. LaHood accused Gonzales of trying to buy the election: Liberal billionaire George Soros contributed $6,000 in “research” to the Gonzales campaign through a PAC, the Express-News reported. Soros is known for spending more than $583,000 in 2016 on Harris County District Attorney Kim Ogg's campaign to unseat an establishment Republican. In November, Gonzales will face GOP opponent Tylden Shaeffer, a criminal defense lawyer and former assistant criminal district attorney. After grappling with a criminal indictment, Republican incumbent Craig Doyal lost his primary race for the suburban, Houston-area Montgomery County judge seat. With all precincts reporting, his opponent, state Rep. Mark Keough, R-The Woodlands, received about 58 percent of the votes. Doyal could not be reached for comment. In February, Texas' 9th Court of Appeals reinstated indictments alleging that Doyal, Commissioner Charlie Riley and political consultant Marc Davenport violated the state’s open meetings law during discussions of a November 2015 road bond election. The decision reversed state District Judge Randy Clapp's dismissal of the indictments last April, the Chronicle reported. The case is expected to return to trial in District Court, and Doyal confirmed he will appeal. Keough has proved a stiff challenger and even picked up some key conservative endorsements, such as one from Empower Texans — a group that denounced him last year for seconding the nomination of House Speaker Joe Straus for another term, according to the Chronicle. In the November general election, Keough will face Democrat Jay Stittleburg. Following clashes with members of her party and county officials, incumbent Jeanne Raley lost in her primary race for Bastrop County GOP chair. Her opponent, local precinct chair Dianna Greenwood, received 65 percent of the votes with all precincts reporting. Raley, who became the party’s chair in 2016 after then-incumbent Albert Ellison was disqualified for filing his re-election bid too early, faced recent criticism for her leadership, the Austin-American Statesman reported. In January, elections administrator Bridgette Escobedo told county commissioners that Raley was being noncommunicative during election coordination procedures. Raley had not submitted a list of poll workers and election judges by the Jan. 5 state-recommended deadline, according to the Statesman. And, earlier this year, Raley hesitated to sign a contract with the county’s elections department, citing fiscal concerns. Republican Party Executive Committee Secretary Doug Kelsay ended up signing the contract in her place. The Statesman reported that Raley attributed the controversy over her leadership to politically motivated acts by several of her party’s precinct chairs, who she said supported Greenwood. McLennan County district attorney Abel Reyna — who has drawn harsh criticism for his handling of a 2015 Waco shooting — conceded the race for his seat to opponent Barry Johnson, KCEN News reported. Johnson, a local lawyer, beat the two-term incumbent with 60 percent of the vote. More than two years ago, nine bikers died and 20 others were injured during a meeting of the Texas Coalition of Clubs & Independents at Twin Peaks restaurant. Under Reyna's direction, the DA's office sought and obtained indictments on 155 of the roughly 200 bikers arrested after the shootout, the Waco Tribune-Herald reported. Federal civil rights suits on behalf of the bikers were filed and there were efforts to disqualify Reyna from criminal cases. By the end of February, Reyna had either refused to prosecute or moved to dismiss a total of 58 Twin Peaks cases, the Tribune-Herald reported. And on Monday, during a Twin Peaks pre-trial hearing, visiting judge Doug Shaver admonished Reyna for using video evidence from the case in a political re-election commercial. Johnson will face no Democratic candidate in November since Waco lawyer Seth Sutton suspended his campaign on Feb. 13 for personal reasons. Additional reporting by Jolie McCullough. Disclosure: The University of Texas at San Antonio has been a financial supporter of The Texas Tribune, a nonprofit, nonpartisan news organization that is funded in part by donations from members, foundations and corporate sponsors. Financial supporters play no role in the Tribune's journalism. Find a complete list of them here. Correction: A previous version of this story gave an incorrect result for the Bexar County Republican Party chair race.